A blind man took on the challenge of diving with three-metre-long sharks at Blue Planet Aquarium in Cheshire Oaks earlier this month. Karl Denning, 43, from Dudley in the West Midlands decided to take the plunge after hearing a comment from one of his daughter’s school friends. “My daughter came home from school and one of her friends had made the comment because her dad was blind there were things he could not do. So the challenge was set,” said Karl. “I started to research on the internet about unusual events and came across shark diving. I phoned around a few places and all point blank said no. 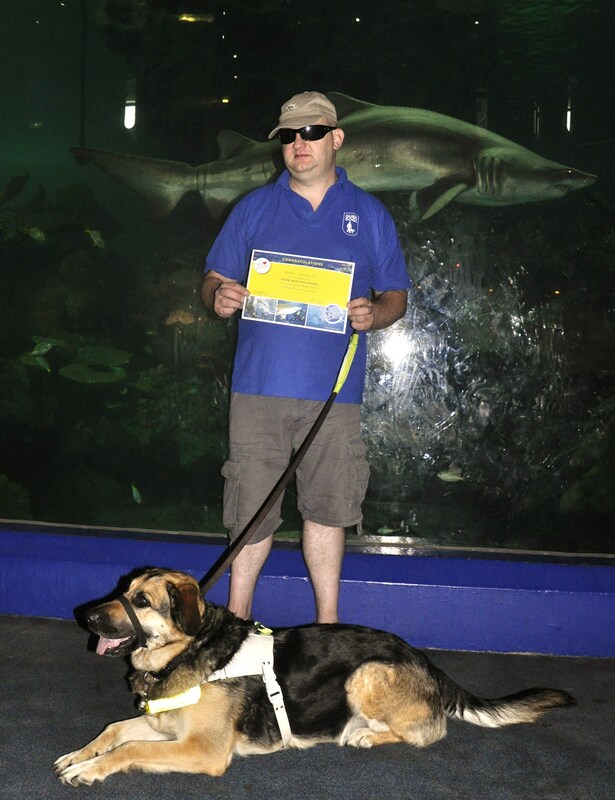 “I then got in touch with Blue Planet Aquarium and nothing seemed difficult, all the staff seemed unfazed that a blind man wanted to get in a tank with sharks,” he added. Blue Planet Aquarium’s team of highly trained divers have wide experience of working with novice divers of all abilities. Dive officer Matt Martin said: “We’re delighted we were able to help Karl prove he really is a dad in a million and we wish him all the best with any future challenges he decides to take on. “Judging by the way he took to diving he’ll have no problems achieving anything else he sets his mind to! “As a dive team we have experience of working with people with a variety of disabilities and enabling them to enjoy first-hand the thrill of diving underwater with sharks and rays,” he added. While Karl underwent his dive training, his family enjoyed a guided tour around the aquarium and were back in position to watch him take the plunge, with the assistance of the dive team. “With no sight underwater at all my dive buddies Julie and Adele guided me, and indicated how close the sharks and rays were to us. I even got to wave to my family,” said Karl. “It was a truly amazing experience, it has to be one of the most restful experiences since I went blind – no phones, no email and no hassle! “There are few people I trust completely to guide me besides my guide dog Quasia, Julie and Adele are now part of the list. “When you are blind stepping outside your comfort zone is a daily task, stepping in to a shark tank is a different matter altogether!” he added.